The Deluxe Chrome Model 98 Winchester Cannon was originally introduced by Winchester in the 1930. It has a barrel and undercarriage that is chrome plated with polished highlighting. The breech closure is hand polished to a high luster. 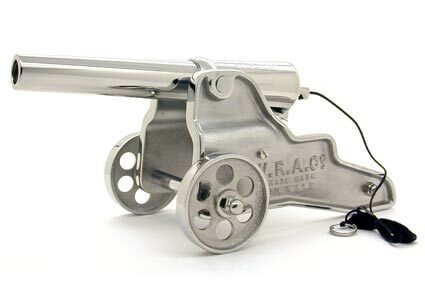 The Deluxe Chrome Winchester Cannon is available factory direct from the Bellmore Johnson Company. For pricing, availability and ordering please visit The Cannon Store or telephone, toll free: (800) 575-2171.